Our automotive odour testing is thorough and comprehensive. We will evaluate the whole vehicle interior, to determine the overall odour character of the vehicle. A well know car manufacturer wanted to evaluate the whole interior of its vehicle, to determine the overall odour character of the car. The analysis was based on combined gas chromatography and mass spectrometry time of flight (GC-ToFMS) of the volatiles compounds emitted by two samples (new car and second-hand car), to identify VOCs that are released inside the two cars and determine if the emitted chemical concentrations exceeded odour threshold value (OTV) levels. 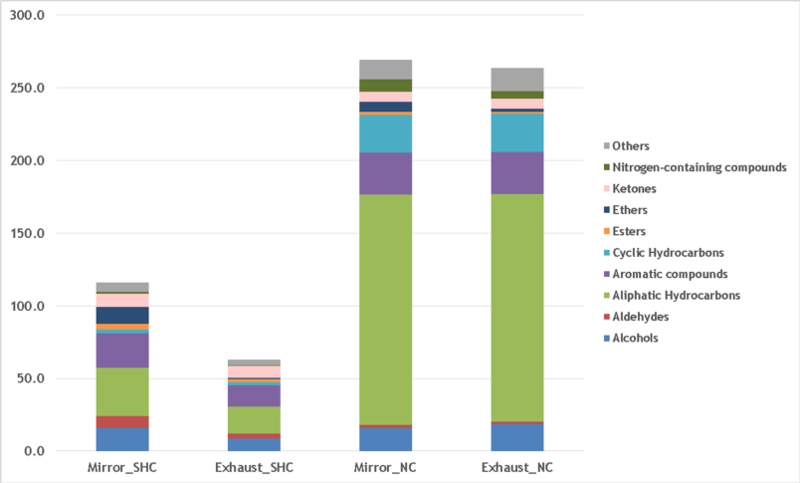 Each sample was analysed in duplicate in 2 different locations of the cars (close to the mirror and close to the exhaust conduct) and different volumes were taken. Images of the sampling: sample close to the exhaust conduct (left) and close to the mirror (right). The predominant families in the samples were aliphatic hydrocarbons, aromatic compounds, cyclic hydrocarbons, ketones and alcohols (Figure 2). Some odour relevant compounds in the second-hand car were the octanal aldehyde, and the organic acid butanoic acid, 3-methyl-. These compounds are responsible for citrus, fatty and green odour notes and cheese, sweat and rancid for the organic acid. The new car had hexanal aldehyde as a relevant compound which generates odour notes of grass, green and fresh. Figure 2. 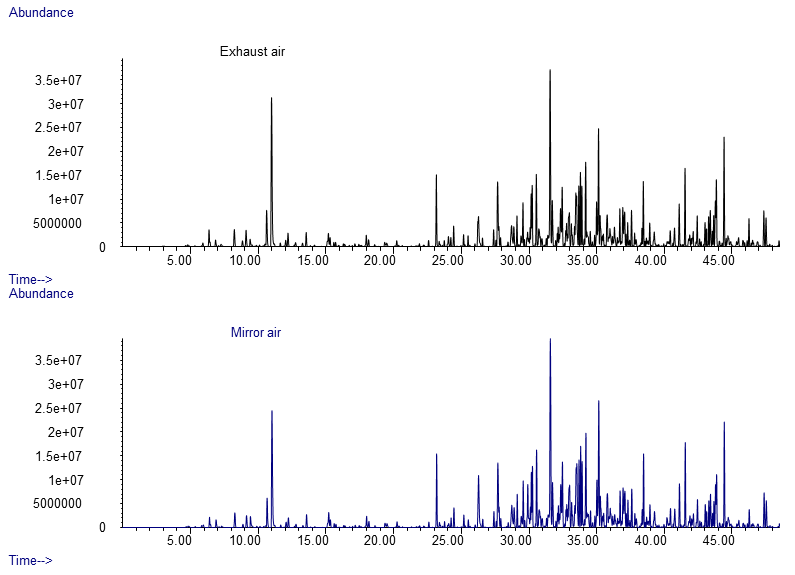 Graphical comparison of the concentrations (ug/m3) of each chemical group in the samples tested. The concentrations for each sample are the result of the average.